There has been much debate lately on Capitol Hill concerning how much funding should be spent on Zika research and prevention. The economic impact that the virus can have in the US could be immense if proper preventative measures are not taken. Many politicians are concerned that not funding Zika research could cost the government more in the long run. Now researchers are able to estimate Zika related costs with an advanced computational calculator. According to researchers the cost of battling the Zika virus after it has started to spread could cost anywhere from 183 million to 1.2 billion dollars. Starting in 2015 the Zika virus devastated the South American country of Brazil, and then the virus began spreading internationally. Today, more than forty countries have citizens that have contracted the Zika virus. Six US states are also at high risk for the spread of Zika. These states include Alabama, Florida, Georgia, Louisiana, Mississippi, and Texas. A group of researchers from New York have recently developed a calculator that gives accurate estimates as to how much money each country or state will have to spend to curb the spread of Zika. This calculator takes into account each country and states infection rates, as well as environmental conditions. The researchers determined that any state or country with an infection rate of .01% would face a cost of at least 184 million dollars. This figure includes many different costs including health care costs and loss of productivity. An infection rate of .25% would end up costing 1.2 billion dollars. To put that into perspective, Puerto Rico has an infection rate of 10%. The calculator did not take into account the loss of revenue from tourism and international and statewide travel. Many countries are unable to meet these financial requirements, which may make a global effort to stop the spread of Zika a necessity. Do you think that the Zika problem will become serious enough to justify a global effort to curb the virus? You would think that being immune to mosquito-borne disease would be a good thing, but a recent study has shown that contracting Zika after surviving a different mosquito-borne disease can make Zika symptoms much worse. The recent study in question was conducted in order to understand why Zika victims in Brazil experienced more severe symptoms than Zika victims in other parts of the world. 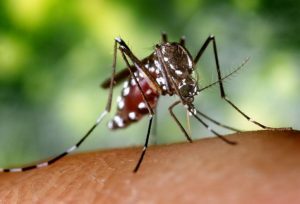 The researchers conducting the study were able to demonstrate that having the West Nile virus or dengue fever before contracting the Zika virus will make the Zika virus much more severe. Typically developing antibodies for one infection can help stave off the occurrence of other closely related infections. However, evidence shows that the antibodies that a person develops while infected with one mosquito-borne disease can help facilitate the Zika virus’s entry into the susceptible cells of mice. This is the first study to demonstrate this link between mosquito-borne diseases in mice. The Zika virus is similar to the West Nile virus and dengue fever in that they are sixty percent identical genetically. The Zika virus, the West Nile virus and dengue fever are all apart of the same viral family. This viral family is known as flaviviruses. Dengue fever is common in Central and South America, and the Zika West Nile are both common in the United States. When you contract a virus your body produces antibodies in order to fight the infection as well as related future infections. Dengue fever, however, was already know to be unique in that contracting one type of dengue will make a person more susceptible to other types of dengue. There are, in fact, four different types of dengue. The research that demonstrated this unusual physiological response to viruses is making scientists rethink the nature of all viruses, not just mosquito-borne viruses. Have you ever contracted any insect-borne disease more than once? If so, what types of disease were they?